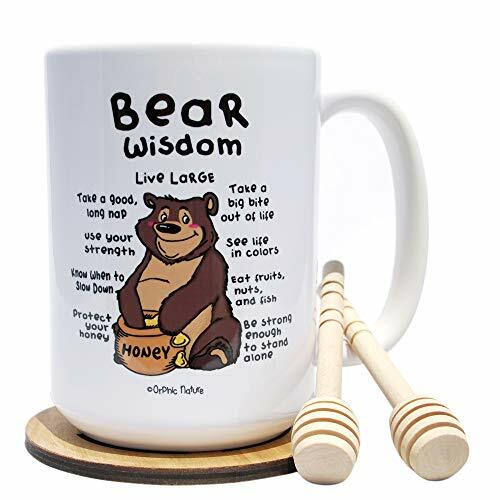 THE PERFECT MUG FOR YOUR SEARCH! STOP the search! You've found the PERFECT MUG for that special occasion. Have Fun and Laugh Together or Treat Yourself to this Delightful Surprise. Announce to the world what you're made of, or what that lucky person is made of. Remember,we are what we do, so display some flare into your life, or 'persuade' others to show theirs. SPECIAL ONE OF A KIND! The Design and Wooden Items are Original Creations from our Workshop, AVAILABLE ONLY through Orphic Nature. HOLDS YOUR FAVORITE DRINKS - Coffee, Tea, that Special Drink (wink wink), Water, Milk, Juice, Smoothie, Soup, anything liquid-ish, etc. We are a US based small business and we are dedicated to bring high quality products and contents to our customers. All the designs and crafts are created in our workshop studio. More good things are on the way, so be sure to check our Orphic Nature series in the future. They are definitely going to be one of a kind products! ***As all woods exhibit distinct characteristics, each of our wooden items also display unique styles. Due to this uniqueness, the actual products may slightly differ in pattern and color. ***Our wooden items are lightly water resistant, but soaking in water will cause damage. Unlike the mugs, they are NOT dishwasher safe. ✔️ WINNER - Share the Laughter or Give Yourself a Perfect Gift. Whatever the Occasion, Enjoy Your Favorite Antidote with Some Personality! ✔️ PERFECT GIFT SET - High Quality Graphic Mug with a Perfectly Matching 2x Honey Dippers and Orphic Wooden Coaster Set! ✔️ SPECIAL ONE OF A KIND - Enjoy the Original Design and Craftsmanship, by us, HERE in USA! ✔️ ORPHIC DESIGNS - Enjoy Our Original Premium Quality Design and Craftsmanship, by US! HERE in USA! ✔️ MADE TO LAST - Sturdy Mug - SAFE for Dishwasher and Microwave! Top AAA graded ORCA coating! If you have any questions about this product by Orphic Nature, contact us by completing and submitting the form below. If you are looking for a specif part number, please include it with your message.